Click here for LRTA Archives for the season September 2012 to September 2013. Click here for LRTA Archives for the season September 2011 to September 2012. The following paper archives have been put together and are being maintained on a regular basis. If you think that you have any items that might make an interesting addition to the Scrap Books, please send descriptive details using the LRTA Contact Form. 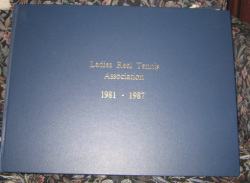 The LRTA Scrap Books contain reports, newspaper cuttings, detailed results, photos and other documents pertinent to LRTA and other events involving lady players over the years. Entries start with the early years of the LRTA and continue up to the current date. Viv Dawes maintains the current book for us. The scrap books are kept on Hayling Island and as they are large and difficult to transport are usually only available for viewing when ladies tournaments are being held at Seacourt. Items for inclusion in the Scrap Book are always welcome (subject to approval by the LRTA Executive Committee). If you have anything you think might be suitable, please contact the LRTA giving your contact details and a short description of the items on offer. The LRTA Match Book contains the results of all matches played by the LRTA. Chantelle Harding maintains this for us. The original World Championships book containing the entries made by the different host countries up until the Championships held in 2009. The contents of the book have also been scanned in by the US and a pdf version is available. A new book has been supplied by the LRTA and is now held in the UK. It is updated after each Championships with information supplied by the country hosting the tournament. This is a file containing paper copies of all the LRTA Newsletters that have been produced. A collection of all the Members Handbooks since they were first published. A file containing AGM Minutes.